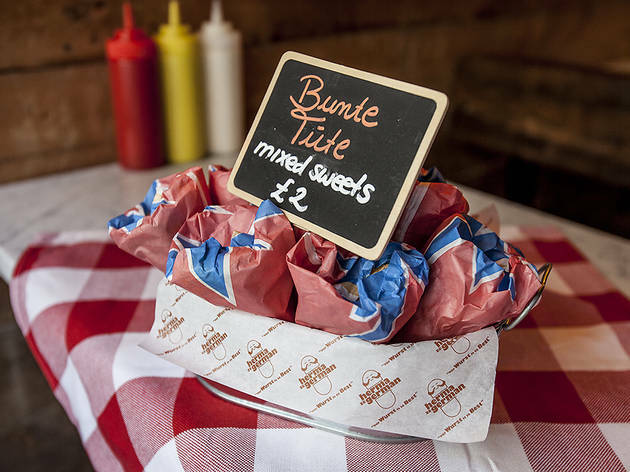 Bow wow and woof woof for these delectable dogs – the best German tube-steaks in London. The last 12 months have been the year of the dog. The hot dog, that is. Previously relegated to being a street food sidekick – the Robin to burger’s Batman – the hot dog has had enough of prancing around in the background with its pants over its trousers, and has elbowed its way on to the menus of sit-down restaurants. First there was Bubbledogs in Fitzrovia – a fine concept (champagne served with interesting hot dogs in a gorgeous space), foiled only by the dogs themselves not living up to the hype. 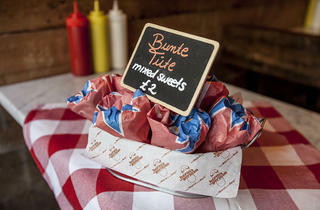 Meatmarket in Covent Garden did a better job – but the burgers are better there. Only the bar at Hawksmoor in Spitalfields, with its knock-your-socks off chilli dog, really impressed. All the above porkers have one thing in common: the US of A. Yup, if any of these prime sausages appeared on an episode of ‘Who Do You Think You Are’, their great-great-granny would have been from New York’s Coney Island. We’ve all been so caught up with the stars-and-stripes invasion, we forgot about the original wiener: the wurst. Until now. Herman ze German, in case you hadn’t guessed, is a purveyor of German sausages. Its outlet on Villiers Street is cherished by sausage fanciers and the late-night commuters of Charing Cross, but is no place to linger. This, its first ‘restaurant’, in the beating heart of Soho, is really a fast-food joint – but its larger size and playfully utilitarian interior (part log cabin, part wet room – with planks on the walls, a painted concrete floor and a butler sink for washing your hands) has made it a place that’s comfortable enough to hang out in. The sausages are imported from the Schwarzwald, and are sehr gut: high-quality pork (no ‘mystery meat’ here), juicy, springy middles and a proper ‘knack’ when you bite. More bonus points for serving them in proper bread rolls (as opposed to a US soft finger bun) – at HzG, you’ll get chewy baguettes. Our ‘ze Wilde Bock’ had a bouncy bockwurst (smoked pork sausage) layered with ‘curry’ sauce (spicy ketchup, preposterously popular in das Mutterland), squidgy fries and crisp onion shards: a sort of Teutonic chip-and-sausage butty. Straightforward sauerkraut with no embellishments proved a suitable digestif; only the sloppy potato salad (with a good taste, but not texture) disappointed. But for a hearty meal in central London that won’t make you bleed through your wallet, it’s time to consider a wiener. The burger is dead. Long live the dog. I was skeptical about trying a German-style fast food place (from Chicago and we have nothing remotely like it), but this place has now converted me to a German-food lover. I got the Schnitzel sandwich (pork), and it was very tasty. But, my friend got the Ze Uber Ding (giant hotdog with jalapeños and cheese) and after stealing a bite, boy was I jealous. It was just incredible. I will be switching up my order next time I visit. This place is great if you need a quick bite, and want a whopping pile of delicious German-prepared meat! This place reminds me of Germany and brings back good memories! If you know how tasty German sausage is and enjoy the taste of German lagers Herman Ze German is will be your favorite place. The fact that it is not too pricey makes it even more recommendable. Popped here for lunch to grab something tasty, quick and a little bit naughty, that's exactly what I got! I ordered one of the daily specials and I wasn't disappointed! Not something you have for lunch everyday but when you do it's a winner! Having nipped in for a lunchtime bite, previously being sceptical about German sausages after the last one was not up to scratch, I was pleasantly surprised by the options available and food itself. A really good atmosphere when dining in to boot. With the number of eateries in the area you can often be spoilt for choice, but you won't go far wrong by heading in this direction. I'm not too used to German food but definitely thought this German hot dog was great!! Really nice hot dogs and friendly service. Nothing mind blowing but it’s perfect for a quick bite in Soho. I like to come here with friends after few beers. Food is great!! Also nice Paulaner!! 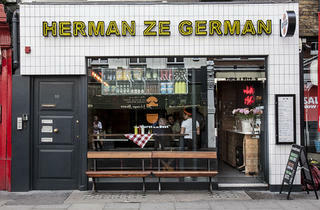 The set up is very casual at Herman Ze German - you order at the counter, then find a seat. The food is served in metal dishes and each table has a roll of paper towel instead of napkins. We had Timeout vouchers for a hot dog, side and soft drink but when we ordered, the staff insisted we could only get fries, not any of the other sides. Luckily the fries were really nice and crispy, but I still would have rather tried something else, like the potato salad or house salad. The service seemed to be a bit hectic and unorganized. We ordered lemon and melon flavored spritzs that were good, but they didn't arrive until after our meal and we had to remind the server that we had ordered them at all. With our voucher, the price was reasonable but otherwise, £5 for a plain bratwurst on a roll (or £6 for a veggie version) is quite pricy. You can pay more for extra toppings or get crispy onions for free, but they didn't offer these up, I had to ask for them. If you're needing a quick meal on a night out, this suits the bill but there are many better options nearby if you're wanting a longer sit down meal. My personal favourite is the Currywurst and chips (Bockwurst every time). The portions are nice and generous. Not the best food I've ever had but pretty tasty. The sausages were good and chips were great, but left feeling horrendously full and really greasy. The service wasn't amazing as it was busy and slow, also a little on the expensive side but an all round ok experience. 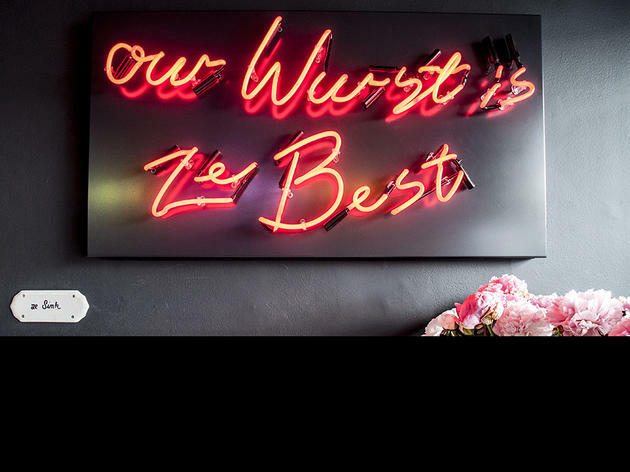 Herman Ze German is one of the best budget eats in soho especially for the fellow wurst lovers out there! The menu consists of 4 different types of bratwurst and chicken or pork schnitzel, which you can have on it's own or in a roll. Then there are a few side options such as cheesy fries, potato salad and coleslaw. 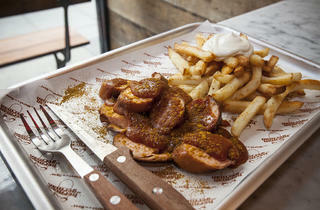 There is even a curry wurst option, any type of sausage chopped up with fries and curry sauce for £5.95. You can get a few extras too for 50p but extra crispy onions are free, win! The atmosphere is lively and the staff are chatty. There's also plenty of room to sit downstairs if upstairs is packed. 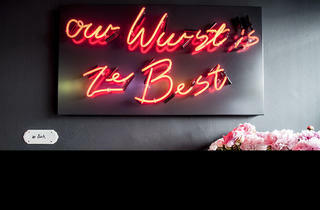 Definitely eat here if you are partial to a good German sausage and don't want to spend too much money on your visit to Soho. I really love the food here (admittedly I only ever get the veggie sausage), but every single time I have been there the staff were very dismissive/aloof. They weren't ever rude outright, but not courteous at all. I have been dying to visit Herman for a while based on the name alone, but had brushed it off as a cheap 'Subway' style snack stopover. I was very wrong as the size of sausage I received could have kept me going all day! The poor boy who served me had to deal with a torrent of questions as the menu is somewhat confusing and annoyingly above the tills so you have to stand in a state of wonder while a queue builds. I eventually went for the bockwurst for a pork overload with a topping of (free onions) and shared currywurst fries which were a decent portion. Although these are similarly priced to a dog, they are well worth it for the curry and cheesy goodness! Table service was nice which made it feel less like a fast food joint and the kitchen roll was well needed. I left feeling very stuffed and satisfied for what was essentially a £6-7 weekend lunch. Although not quite the most unique decor, the food is much better than say Bubbledogs and I would pop in again for more excellent dogs to try out the other toppings! Cheap and convenient, these are some fantastic German sausages.They're big, thick and ooze with savoury juice as you bite into the tender skin, and you'll hungrily wolf it all down before you know it. I can't say I care much for the bun, but they serve up some good chips to go with the wiener, which you'll pick at sadly after realizing you've already eaten the whole sausage. Nice bricky interior, although the menu is slightly confusing. Would come back again for another bite of that sausage because it awakens some serious primal instincts inside me I thought I'd lost. Great for a cheap lunch in Soho and fancy a treat. The currywurst is excellent and worth trying. Portion sizes are very generous especially if you upgrade for an extra cheeky sausage. Served with a unique brand of soft drink or beer it makes a nice change if you fancy something different. Service was welcoming and very friendly explaining what options you can have. Eat in or take away available. Sausages being freshly cooked in the background. 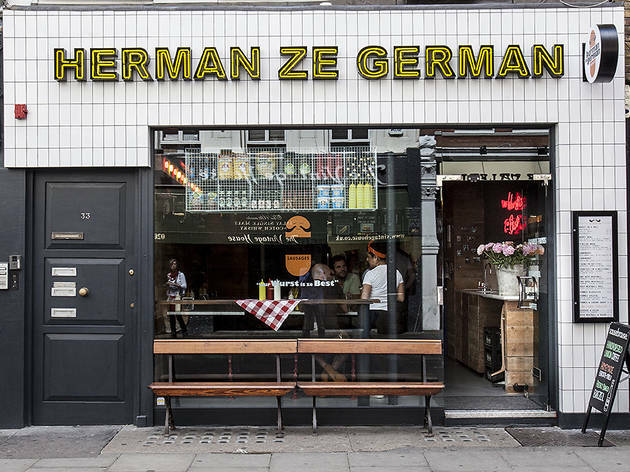 You can take pride in walking through Soho with your Herman Ze German branded paper bag containing some great tasty food. This is definitely in my Top 5 cheap eats options in London. Ze Wild Bock Roll is the best including crispybits and their chips are amazing. Crispy and delicious and you get just enough to feel full but not uncomfortable. It's also reasonably price. CHECK IT OUT NOW! Even with the recent surge in restaurants specialising in hot dogs, this is still the best place for top quality sausages in buns. The Germans know what they're doing, right? This place has a great selection of draft and bottled beer, and the currywurst is the best I have tasted outside Berlin. Currywust at it's best! I don't think you can go wrong with sausage and sauce, can you? It is simple, but comforting, afforable and tasty. There is larger seating area in the basement, which can accomodate groups larger groups as well. A convenient spot to stop by after you had few drinks in Soho... or just because! Now i'm not particularly one for German cuisine, I recently went to Berlin and had Currywurst - it genuinely was the curryWORST. But Herman ze German has completely changed my perceptions. I had the chicken schnitzel sandwich and it was glorious. It fell apart in my hands as the mustard and brioche bun combined to mush but the flavours were amazing. Will definitely be going back. Sehr Sehr gut. This place hits the spot every time from the childish giggles at the phallic sign to the juicy hot dogs this place is great. The addition of sauerkraut and the pomme frites sides with ketchup and mustard are probably the best drunk food a girl can ask for. As the weather is getting steadily colder and wetter this is the place to pop into for comfort food to fill the sad space left by sunshine. The Best Sausage in Town ! They were the best of times, they were the wurst of times. So said London hero Charles Dickens shortly after penning another beloved mildly anti-Semitic pickpocketing adventure. How could Charles know that, years later, the eponymous Herman would arrive in town, declaring this little spot of London forever German and serving up some of the finest sausages this side of the Reichstag. What more can one want for £6? Pop down a few marks on the counter and you'll be resented with a delicious tube of tasty German meat, crispy onions and supertasty curry-saucy fries. I'm only taking a star off because I got the aforementioned sauce all over my face on the train home from Charing Cross, which, frankly, ruined the journey of not only myself but those sitting around me. Right this way, your table's waiting, as Sally Bowles said - not specifically about sausages, I'll give you that, but because she was in Germany at the time and would no doubt have approved of all this. Really good German food and beer, a rarity in London. 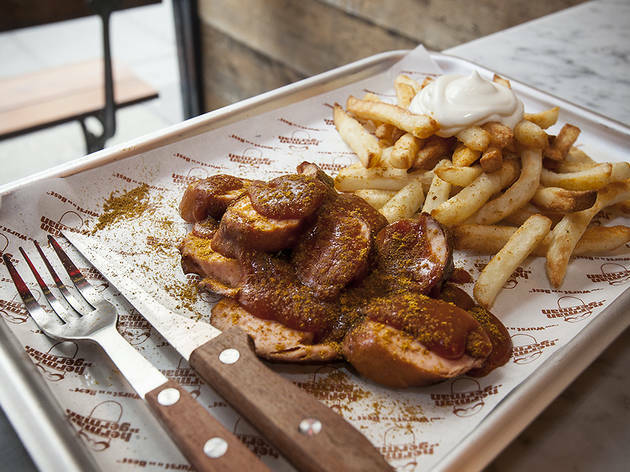 Their chips are great, their bratwurst is smoky and juicy, and the restaurant is clean and efficient. It's a brilliant place to grab a quick bite or a naughty lunch. I would recommend getting the cherryade; it's pretty addictive. I love the look and feel of this place - and the wursts are amazing.... but the presentation and quantities vary greatly every time I go. To be fair, I know that the pics are always going to be a fair bit better than in an everyday setting - but recently portions have been small and loosely chucked on the plate. Time to concentrate on what you are good at rather than opening several more outlets? Straight forward menu, quick service and tasty dogs. Filled me up and left me happy on a number of occasions! Good branding, and several aspects to make you giggle (including the logo!). If you're looking for a decent hot dog in Soho, this is the place to go! I really like this place and a good addition to Old Compton St. Has the no fuss self service of Mr Moaz but a little more relaxed and there is beer! Very good beer and at the same price and better quality than most of the bars in the vicinity. Mr Moaz might end the evening but this place is a good start with friends. Not a date place - you'll get dumped! Expensive but quite tasty fast food. Good German lager. We had two chilly sausages with curry sauce, two small chips and two halves of a pint which cost over £18: in my view, a little on the expensive side given the small portions! Yet, this is a welcome addition to Old Compton Street' s fast food venues. It's a hot dog - seriously - a hot dog. Don't expect some kind of Michelin star service and food for a tenner! BUT great quality wurst sausage, proper buns and an interesting mix of drinks. In and out in 10 minutes. Well worth a visit. Had high expectations (after reading all the good reviews) dashed at the first sitting. - half a sausage portion (made me angry) - French Fries were cardboard taste/texture like McD's and again a tiny portion. - salad was tiny and lacked style and substance - felt like I got mugged - went for a great Korean meal immediately afterwards to cheer us uo (even though we are both of small-medium appetite) The only positive was the beer on tap was pretty tasty as was the Wurst (but I want a whole one not a few slices!) So two measly main courses and one Beer to share came to over £15. We could have super sized for £2 extra each. Sure that would've filled us up with the cardboard French Fries, but in retrospect we were glad to leave. Sure that Herman would work much better in a street market or pub context, however they need to try a lot harder in a sit down to eat context. Avoid... unless you are a flatulent, drunk, Tory voting ,white, male, middle class, yuppy.